Find Us on FaceBook and YouTube at "Nina's Warriors"
How Do You Kill CI? When is CI Most Dangerous? Could it be in Hay? How Do I Mark The Map? What Part of CI is Toxic? 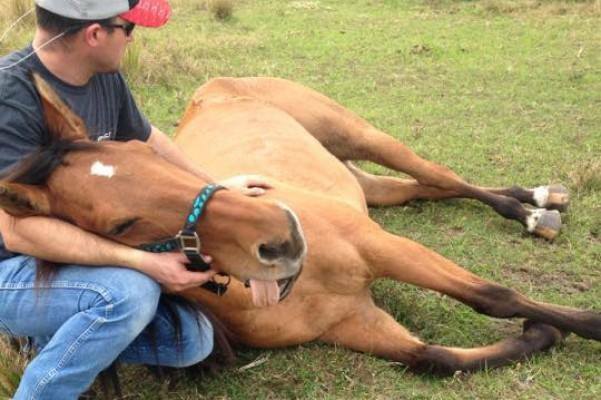 Are Well Fed Horses at Risk? Why Aren't More Cattle Sick? Can it Survive Cold Weather? Beginning in the Fall of 2014- my 9yo AQHA Mare, "Frostover Fires Dust" (aka: "Nina") and her herd were suffering from a mysterious and progressive, reoccurring neurological illness. 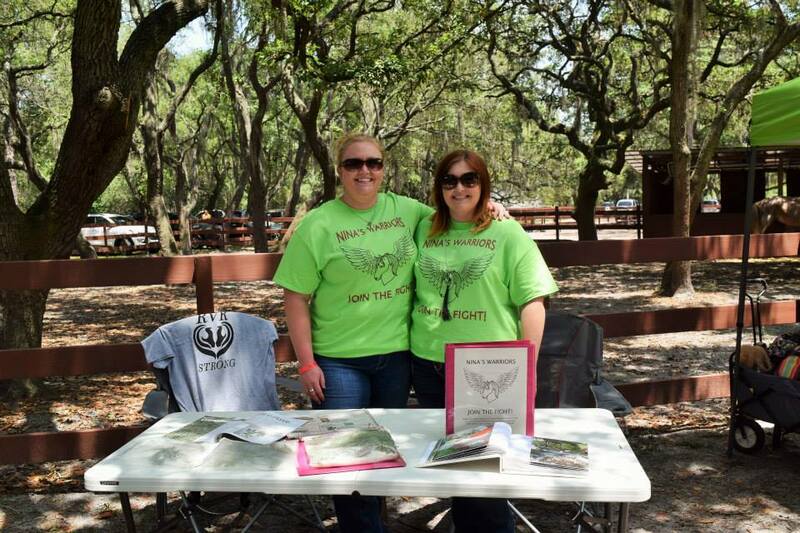 Myself and my friend Sara Rogers, who owned the other three herd members, as well as the ranch, where Nina lived, went through three different vets over the course of four weeks trying to diagnose and save our beloved horses. After being diagnosed incorrectly over, and over again and assessing thousands of dollars in vet bills throughout November and December of 2014, Sara and I, took matters into our own hands and locked the horses up in their stalls. At this point, we were desperate to save our animals and fearing foul play. So, we turned to the internet for help. 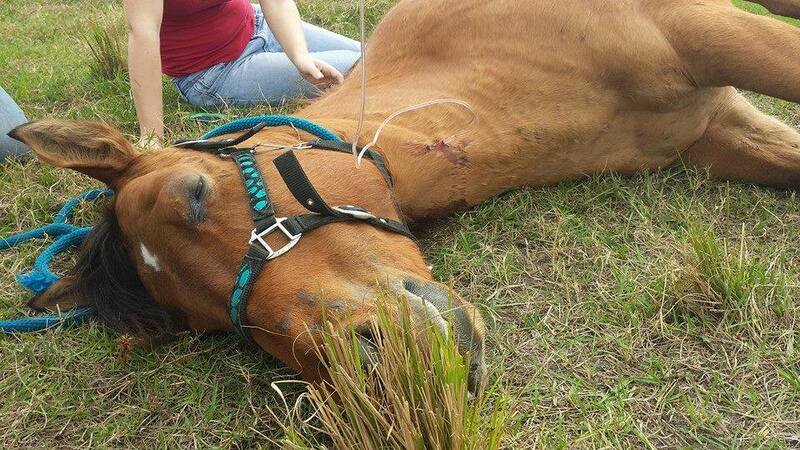 On December 20, 2014 I shared Nina and her herd's symptoms on a social media forum specifically for the Florida Horse and Livestock community and begged the public for help determining the cause. Hundreds of suggestions began to pour in. I tirelessly researched every suggestion and ruled out illnesses one by one via symptoms that didn't match etc. I was able to narrow it down to about ten potential illnesses and then, we made what we knew would be the last vet call we could financially handle. He drew blood from Nina, who on this day, had the worst symptoms and took it back to the lab confident he would find a parasite in the cells. But, to his surprise, no parasite was found. In fact, Nina's blood panel was shockingly normal. She was only borderline anemic but, he noted she had high levels of CPK. (which is a result of muscle stress) He now was sure that our horses had been poisoned by Creeping Indigo and he openly admitted that little was known about that weed. He admitted that he also, had little experience with it at all. So, he directed us to the internet for eradication guidance but, warned that there was NO CURE or treatment available for animals with this type of poisoning and that symptoms were largely irreversible in neurological stages. Please, beware, this video is difficult to watch. As the vet instructed, we immediately began researching this weed we had NEVER heard of before. That is when we realized, there was little to no information on the internet for Creeping Indigo at all. Further concerning, many images of Creeping Indigo contradicted the little blue flower the vet had shown us. So, we again turned to the horse forum, this time we had a diagnosis but, we needed help identifying the weed. We realized VERY QUICKLY that we were not alone. To say that very few members of the horse community even knew about this weed is to put it lightly. The weed was nowhere to be found on noxious weed websites and any other resources like: handbooks and posters, shared by the forum. Late in the evening on December 23rd, a member who had been following our pleas for answers who had lost two horses to Creeping Indigo earlier that year; reached out to help. She further confirmed our fears that the diagnosis was accurate after comparing our timeline of symptoms to that of her own horse's prior to their death. She provided us photos of the weed from her own pasture. But, she also warned that we were nearing an escalation in symptoms that would be very difficult to watch them suffer through. Exhausted, both emotionally and physically and now facing the reality that Nina's death was imminent. I rushed out to the farm at the first sign of daylight the following morning, which was Christmas Eve 2014. With my sister by my side, I began what would be the last of numerous pasture searches. Though, this time, we had a lead suspect, we were still open to yet another misdiagnosis. We were prepared with print outs of every noxious weed in the state of Florida. The first 3 acre pasture was searched with nothing found but, a Brazilian Pepper tree. Before searching the remaining 10 acre pasture, we took a break to offer comfort to Nina and lead her to the water trough where she preferred to drink. We filmed her in-coordination which, was the worst it had ever been. But, after being cooped up in her stall for over a week, while the pastures were under suspect, Nina did not want to return to her stall. We decided to grant Nina her wish and not force her back into her stall. We allowed her take a walk, knowing, she couldn't go far. Meanwhile, we continued documenting her condition. She walked through the pasture like a tiny ship in stormy seas and then came to rest with her head hanging about an inch from the ground where she froze with exhaustion. As I approached her to comfort her I was horrified to discover that she was standing over Creeping Indigo, the plant I never wanted to find. I called out to my sister and my friend "It's here! It's right here! Nina is standing in it!" They came running and as we raised our sights and walked the grounds, we were horrified by the realization that the deadly weed covered nearly 60% of that 10 acre pasture. But, it was too late for sweet Nina. She collapsed where she stood, surrounded by the very thing that was killing her. The vet was called and so began a 13hr fight for her life. But, she would never walk again. Friends, family and supporters who had been following her story came from all over to provide fluids and supplements. Even, to help hold her up for IV treatment as she could no longer stand on her own. The toxins had paralyzed her face, tongue and digestive organs. Efforts to save her went on into the night but, she tragically lost her life Christmas day 2014 at about 1am despite the valiant efforts of so many. The surviving three members of the herd went on to recover thanks to Patti Fielder, with Amber Glen Equestrian Center in Pinellas Park, FL who came to our rescue and bravely took their treatment on. They have recovered 100% against all odds. Nina's Warriors slowly but, surely developed into a Creeping Indigo resource for information. By the end of February, with the herd on the road to recovery, we officially changed gears from "herd updates" to an "awareness spreading, research and information sharing" machine. WE MUST SPREAD AWARENESS and ACCURATE information on this deadly plant as deep into the community as we can and we NEED YOUR HELP!